The installation of pattern imprinted concrete can be affected by weather conditions, particularly heavy rain and very cold temperatures. Contractors should therefore commit to keeping their customers aware of any delays in carrying out the various procedures involved which may affect the progress through to completion. Some companies make a point of insisting that all of their installers are employed rather than sub-contracted and on the face of it that is a good thing. However, it is better to have a smart and presentable, experienced and committed sub-contractor to carry out the work than an inexperienced employee. The more important point is that the company which contracts to carry out the installation provides and honours a credible guarantee for the job and doesn’t merely point to a sub-contractor if there is a problem. Safe access to the property should be provided throughout the pattern imprinted concrete installation process, especially when the front driveway and or garden are being paved. The access route should be obvious not only to the homeowner but also to visitors such as those delivering post or parcels. Barrier tape should be erected around the perimeter of the site to discourage visitors accidentally walking over the surface but a watch should be kept out for stray cats and dogs. Excavation of the site should be at least down to a firm sub-grade of ground and the stone sub-base should consist of the correct material (ideally Type 1 MOT), be at least 100 mm thick and properly compacted to within a 10 mm tolerance. The walls, windows, doors and gardens of nearby properties which could suffer from splashes of concrete, wind-blown dust from colour surface hardener and antique release agent or the spray from sealant should be protected. Wall gel should be used to protect brickwork and boards or plastic sheeting for windows, doors and gardens. All concrete should be delivered ready-mixed by an accredited member of the Quality Scheme for Ready Mixed Concrete (QSRMC) to minimise the risk of being supplied with poor quality or wrongly prescribed concrete. 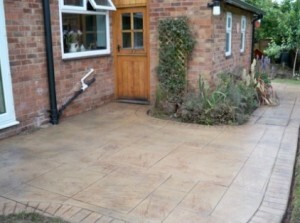 For pattern imprinted driveways, concrete should be a minimum of 100 mm thickness and pedestrian only patio areas a minimum of 75 mm thickness. It should have a minimum cement content of 320 kilograms per cubic metre in warm months but more when installed during colder months. Concrete should also be reinforced with polypropylene fibres to improve impact resistance and contain an air entraining agent to reduce flaking of the surface. No less than 2.5 kilograms of colour surface hardener should be applied to each square metre of pattern imprinted concrete. This will not only ensure a consistent colouring of the surface but will also strengthen it to help reduce the potential of cracking. Antique release agent powder should be scattered onto the surface of the concrete prior to printing to add a two tone effect to the coloured concrete and the help in removing the printing mats without damaging the printed effect. A sufficient number of printing mats should be used to at least span the narrowest part of the driveway, with typically six hard mats and one flexible mat being used. Antique release agent powder should be left on the surface for between one and four days depending on the time of year to help the concrete to harden, shorter periods during warm summer months. A proprietary release agent wash is used to remove it and the surface should be power washed until the water runs clear. Leaving excess antique release agent powder on the surface can cause the sealant to fail. No contractor can guarantee against random cracking of the surface of pattern imprinted concrete but there are several measures which must be undertaken to minimise this risk. Properly prescribed concrete and sufficient colour surface hardener are two of these but the correct use of contraction joints is probably the main one. The requirement for, and the position of, contraction joints should be explained to the customer before any work commences as it may affect the chosen pattern. It is much easier to disguise a contraction joint in a pattern of predominantly square and rectangular shapes such as a cobbled design than one with curved lines such as the European Fan. Few customers like the presence of contraction joints and some dislike them so much that they would prefer a pattern on which they are not so prominent, to their first choice pattern. Solvent-based acrylic sealant should be applied in several thin coats using a sprayer unit but only once the surface is absolutely clean and dry. If the surface is damp, the sealant will not bond to, or penetrate the surface of the concrete and will fail requiring it to be removed with a proprietary cleaner, washed down, dried and sealed again. Water based sealants should not be used. Finally, the installation should be checked by the site foreman and the customer together before the site is cleaned and the contractors leave.